Poet and satirist; born in the castle of Steckelberg, near Fulda, April 2l, 1488; died on the Isle of Ufnau, Lake Zurich, Aug. 29, 1523. As a humanist and one of the strongest champions of the Reformation wielding a sharp and vigorous pen in defense of religious freedom, he sided with Reuchlin in his literary feud with Pfefferkorn, Hoogstraten, and the Dominicans of Cologne. 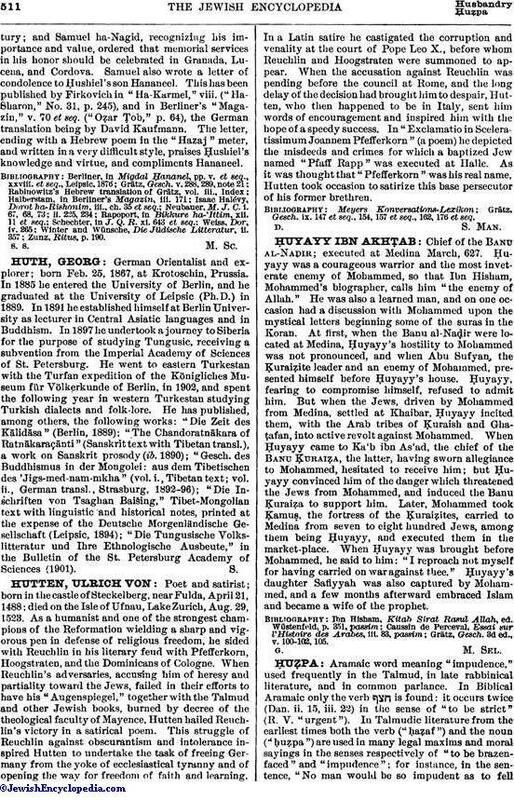 When Reuchlin's adversaries, accusing him of heresy and partiality toward the Jews, failed in their efforts to have his "Augenspiegel," together with the Talmud and other Jewish books, burned by decree of the theological faculty of Mayence, Hutten hailed Reuchlin's victory in a satirical poem. This struggle of Reuchlin against obscurantism and intolerance inspired Hutten to undertake the task of freeing Germany from the yoke of ecclesiastical tyranny and of opening the way for freedom of faith and learning. In a Latin satire he castigated the corruption and venality at the court of Pope Leo X., before whom Reuchlin and Hoogstraten were summoned to appear. When the accusation against Reuchlin was pending before the council at Rome, and the long delay of the decision had brought him to despair, Hutten, who then happened to be in Italy, sent him words of encouragement and inspired him with the hope of a speedy success. In "Exclamatio in Sceleratissimum Joannem Pfefferkorn" (a poem) he depicted the misdeeds and crimes for which a baptized Jew named "Pfaff Rapp" was executed at Halle. As it was thought that "Pfefferkorn" was his real name, Hutten took occasion to satirize this base persecutor of his former brethren. Grätz, Gesch. ix. 147 et seq., 154, 157 et seq., 162, 176 et seq.